In 2013, the G20’s focus will be placed on reforming the global financial architecture amid speculation that the IMF, the dollar and the euro will remain the core of the global financial system. Reforming the global financial architecture will be a key priority for Russia during its rotating presidency in the G-20, Sergei Storchak, Russia’s deputy finance minister and the government’s representative to the G-20, said in an interview with the Voice of Russia. He focused on the history of the Group of Twenty Finance Ministers and Central Bank Governors and changes in its activity after the global financial crisis. Russia will be at the helm of the G-20 throughout 2013. The G-20 was created as a response both to the globalisation of the economy in the late 1990s and to a growing recognition that the key emerging-market countries were not adequately included in the core of global economic discussion and governance. The G-20 was formed with the aim of coordinating this process, Sergei Storchak says, adding that the group brings together twenty important industrial and emerging-market countries from all regions of the world. “The G-20 was proposed as a forum for cooperation on matters pertaining to the international financial system, which highly depends on changes in the global political and economic environment,” Storchak says. At the beginning, the G-20 was used as a venue for exchanging views between the Finance Ministers and the Central Bank Governors of member countries. The situation changed after the global financial crisis took place in the mid-2000s, prompting politicians to refer to using the G-20 mechanisms. In particular, a decision was made to hold the G-20 Summits of heads of state in a move that Storchak says helped to quickly get over the crisis. A real reform of the International Monetary Fund (IMF) has begun, Storchak says, referring to a spate of steps that contributed to the financial regulation of global markets. Additionally, a decision was taken to replace the Financial Stability Forum with the Financial Stability Board, Storchak adds. Among other issues, the G-20 currently deals with superseding bank credits which have long contributed to financing investment processes. In 2013, the focus will be placed on reforming the global financial architecture amid speculation that the IMF, the dollar and the euro will remain the core of the global financial system. It is the parameters of this system that should be changed, Storchak says. “First and foremost, he says, it is necessary to fulfil a spate of quota and voice reforms related to industrialised countries and emerging-market economies within the IMF. 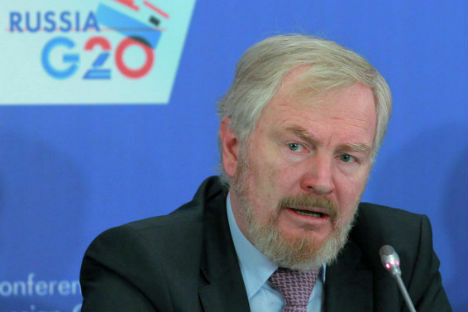 The reforms will see developed countries’ quotas being shifted to developed countries,” Storchak says, singling out two systemic tasks that Russia should resolve during its rotating presidency in the G-20. “First, it is necessary to reach a consensus on the formula for calculating the quotas. Second, we should tackle the redistribution of the quotas which will help us increase the quote sum and the amount of money that member countries are obliged to contribute to the IMF." The G-20 groups 19 major countries plus the European Union. In all, the G-20 member countries produce 90 percent of the global GDP and fulfil 80 percent of international trade.